NOTICE: Activation key must be used on a valid Steam account, requires internet connection. ABOUT THE GAME	Sheltered is a deep and emotional survival management game. You take on the role of protecting four family members who, after a global apocalypse, have found their way to a deserted shelter. Panting, scared, the shelter airlock smashes down behind you. You wish you did not ha… ve to go outside, but you do. It would be easier to give up. But you don’t. The hardship, the hunger, the thirst. The fear. You keep reminding yourself why you stay alive. Why you do this. Then you hear it. “Daddy, you’re back.” You wife’s face lights up and you open a bag full of medical supplies. You need not tell her how you got them. You simply enjoy your small victory in this, the harshest of times. 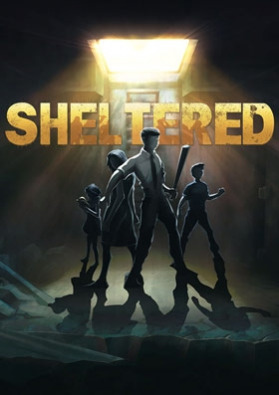 In the post-apocalyptic world, you must keep your family alive in your underground bunker in this deep strategy game from Unicube... Sheltered is a post-apocalyptic disaster management game that gives a whole new meaning to the term “nuclear family”. Given a head-start over the billions lost in a nuclear holocaust, you must gather as many supplies as possible en route to the concrete underground shelter that will soon become your family home for the foreseeable dreary future. With all hope lost, how will you cope in this bleak new world? How you handle the many moral choices you'll encounter on a daily basis could be the difference between your family surviving or dying. Combat claustrophobia, radiation and mental exhaustion as you cling desperately to life in the cramp, cold and scary underground shelter. You’ll have to leave the scant protection the shelter offers behind as you’re forced to venture outside into the dangerous desolate wasteland to scavenge for vital supplies which could ensure your family's survival for just one more day. KEY FEATURES Family comes first: Keep your family alive and protect them from the ravages of the harsh post-apocalyptic world. Make the shelter a home: Maintain your shelter - keep it secure, habitable and make sure that the family have enough resources to survive. Protect your shelter from hazards and infiltration! Customisation: Your family is unique to you; you decide their gender, names and their appearance. RPG mechanics: As your family develop, their stats will adapt with an evolving experience and trauma system. Attributes, strengths and weaknesses will dynamically change based on your choices. Crafting system: Create comforts for your family’s shelter and weapons for combat. Exploration: Send out your family to explore and gather resources for everyday living and crafting. Recruitment system: Recruit outsiders with different personalities, integrate them into your shelter life and earn their loyalty. Dynamic encounter system: Your family will encounter various threats including roaming factions and feral beasts. Turn-based combat: For those that cannot be reasoned with, violence can be used as a last resort. Your family may depend on it. Pets: Your pet is family too. Choose between the dog, cat, fish, snake or horse. Vehicles: Make exploration quicker and safer. SYSTEM REQUIREMENTS Windows OS: Windows XP Processor: Dual Core CPU Memory: 1 GB DDR2 Graphics: GeForce 7800, AMD HD 4600, Intel HD Graphics 3000 or above DirectX: Version 9.0 Hard Drive: 600 MB available space Sound Card: Windows Compatible Card Mac OS X OS: 10.8.5 Processor: Dual Core CPU or higher Memory: 2 GB Graphics: Nvidia GeForce GT 330M, AMD Radeon HD 5750M, Intel HD Graphics 4000 or above Hard Drive: 700MB	SteamOS + Linux OS: Ubuntu 12.04 64-bit / Ubuntu 14.04 32-bit or later Processor: Dual Core CPU or higher Memory: 2 GB Graphics: GeForce 7800, AMD HD 4600, Intel HD Graphics 3000 or above Hard Drive: 650 MB available space Sheltered. Developed by Unicube and Team 17 Digital Ltd © 2015. Published by Team17. Team17 are trademarks or registered trademarks of Team17 Digital Limited. All other trademarks, copyrights and logos are property of their respective owners.